Sussex’s Jofra Archer and his Hobart Hurricanes are guaranteed top spot in the Big Bash League table and a home semi-final. But the defending champions, the Adelaide Strikers, have failed to qualify. The Hurricanes beat the Melbourne Renegades by 16 runs as Archer took 2-19 off his four overs. The Tasmanian side set a total of 183-6 with Matthew Wade top-scoring with 58 runs off 30 balls. The Renegades couldn’t find a decent partnership to get them over the line, but Tom Cooper top-scored with a respectable 44 off 34 balls. The Hurricanes beat the Brisbane Heat at home by a comfortable nine wickets last Tuesday as Archer took 2-28, with Matthew Wade and Caleb Jewell scoring an unbeaten 68 and 61 not out respectively as they got to their target of 146 with 5.4 overs to spare. However, the Tasmanian side lost to the Strikers, coached by Sussex head coach Jason Gillespie, on Thursday by seven wickets, with Rashid Khan producing figures of 2-28 off four overs for the South Australian side. Jake Weatherald was the star of the Strikers’ innings scoring 82 off 42 balls, reaching the target of 170 with 2.1 overs to spare. Wade’s 88 for the Hurricanes in the first innings wasn’t enough to set them a defendable total. 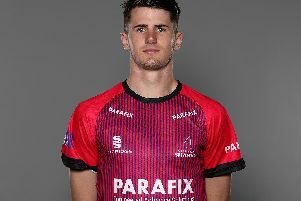 However, Thursday’s victory for Gillespie and Khan’s side was not enough to give them a chance to qualify for the play-offs as they lost to the Sydney Sixers by eight wickets on Tuesday and were defeated by the Brisbane Heat on Sunday by six wickets. They sit in seventh place on 10 points with one game left and are two points behind fourth, but the Melbourne Stars, who are in the final play-off places will play the Brisbane Heat, who are one point above the Strikers, leaving it mathematically impossible for the Strikers to qualify. Meanwhile, Chris Jordan has performed well for the Sydney Thunder, but they have only an outside chance of qualifying for the play-offs. They lost both games during the week - against the Melbourne Renegades by 27 runs and the Sixers by nine wickets via the Duckworth-Lewis method. Jordan has taken six wickets in six games in the tournament, including 2-44 on their trip to the Renegades’ Marvel Stadium. The fifth-placed side are one point behind the Stars, who are in the last play-off spot, but would have to rely on the Melbourne side to lose both their remaining fixtures. The BBL is heading into its final week before the semi-finals get under way. The Hurricanes will travel to the Manuka Oval to play the Thunder on Saturday at 7:15am. Before that, the Strikers will host bottom-side the Perth Scorchers, also on Saturday, at 3:45am.